When it comes to lips, how does “glorious long-lasting colour paired with high-shine gloss” sound to you? 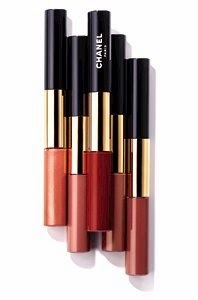 Add to that “delivers full-coverage colour that lasts all day” and the name Chanel, and you have my absolute favourite lip look for right now. Known as Rouge Double Intensité, it first a liquid lipstick with a formula that is concentrated with micronized pigments and rich in polymers. Think major pigment payoff and colour that lasts - magic. Volatile oils give it rapid, no-transfer drying to boot, and I've been doing some major days-into-evenings with this formula with zero complaints. But wait, there’s more: it is also a transparent gloss. Used as a top coat, it adds an ultra-shiny layer, ensures comfort and revives colour for more intensity with major hydration. 46 Deep Rose: a subtle plum. 48 Soft Rose: a gentle brownish pink. Even better yet - these beauties are on counter right now!